A checkerboard or chequerboard (see spelling differences) is a board of chequered pattern on which English draughts (checkers) is played. It consists of 64 squares (8×8) of alternating dark and light color, often black and white. Other rectangular square-tiled boards are also often called checkerboards. In this sense it refers not to a physical board as such but to the mathematical abstraction of such a board. The adjective chequered refers to the pattern shown in many contexts, such as the checkered flag used to signify the end of a vehicle race, the popular ice cream flavor or the livery on some emergency service vehicles. However, when this pattern is used on such vehicles, in certain countries, it is called a Sillitoe Tartan. A red-and-white checkerboard is the medieval coat of arms of Croatia, and is widely used in national symbology there. 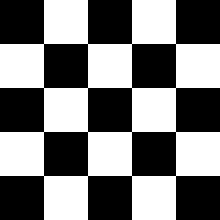 The checkerboard pattern is often associated with the Ska music genre, for breaking the racial barrier between black and whites at the time. A checkerboard marking painted on a hilltop was used as visual guidance on Hong Kong's old Kai Tak Airport. Many taxicabs also use a checkerboard pattern. A checkerboard pattern of alternating aviation orange and white is commonly required for compliance with the FAA as a means of making tall or sufficiently sizable structures stand out, so as to make them clearly visible to pilots, including water tanks, gas tanks, grain storage tanks, tall buildings and flags. The following games require an 8×8 board and are sometimes played on a chessboard. Look up checkerboard in Wiktionary, the free dictionary. ↑ "Obstruction Marking and Lighting" (PDF). Advisory Circular. U.S. Department of Transportation Federal Aviation Administration. Retrieved 2013-09-09.